What a crazy week, it looks like my desk threw up with all the hobby stuff piled on top. I did manage to get a few things done this week. 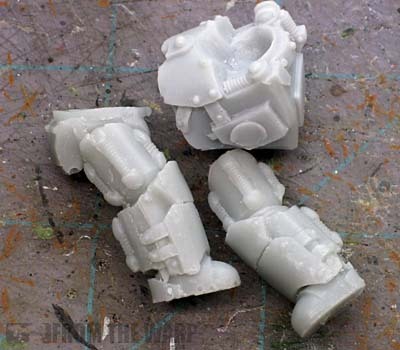 While you can't see it, I sculpted and then cast the kneepads for my Chaplain conversion. I had to scratchbuild each one last time and I wanted to see if I could make one and then get a nice matching set this time. It took me a few tries with the mold, but I got it. I also picked up a bunch of new stuff this week. What can I say other than I'm a sucker for leaves. i don't what it is about them on bases, but they just look so cool. 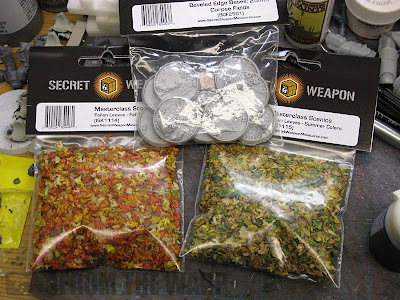 I've got two new kinds now to play with from Secret Weapon minis. One other little toy I picked up was the parts to make a truescale terminator from Three Stage Studios. I'm planning on painting him up Space Hulk style once I get him built. I'll have my thoughts on "truescale" stuff too. It's been quite and interesting experiment to say the least. And for those truly keen eyes, you might notice a set of Novamarine decals there. Actually they're hard to miss. I have lots of decal stuff coming up soon. I'm learning all kinds of things about decals and models. 2 quick questions for you,you said those terminator bits came from GSI,I just looked at the shop and couldn't see any,so the question is did you get some pre-release ones or am I totally blind? And the other is,have you ever checked out Bitspudlo? They're another awesome Polish company,recently bought some terminator/obliterator bionics from them (you actually get enough to make 2 models with the pieces,not very keen on the arms though),hadnt heard of them until a month ago and then they got $60 from my first visit. Have fun with the leaves,wanting to buy some myself but cant really think of a use for them apart from one or two unique models I have (Kingdom Deaths' Flower Knight for example).Hope you're planning on doing an article about them,very keen to see what you can do with them. Hah, nice to see someone else is having a bit of project ADD too.. I've usually got 1 or 2 things on my desk at any one time and this weeks it's like.. seven! eep. need to get those finished and be a bit more focussed. I'll admit i'm a decal convert, thanks for FW using them properly on vehicles got me also using them properly on minis and I wouldnt go back now. I am really looking forward to reading your thoughts on truescale and on decals! Looking forward to seeing what you can do with the SWM Leaves, looking at picking some of those up myself! IDICBeer: Yes, I have lots of cool stuff to share in the next few weeks. Oktane: My mistake. It's Three Stage Studios. not GSI, I was looking at a model I had in front of me while I was putting the post together and listed the wrong company. I will be doing a post about leaves too. I need to refine my application process a little bit first. Karitas: I've got tons of stuff I want to do, I just try and work through one thing at a time... which can be tough sometimes. KrautScientist: Yes, I will. I used the GW ones and then I've gone about making my own. I cover two ways to apply them and some problems you might face (wrinkles). And playing around with truescale has been a very interesting trip. I've learned a good bit about the whole process I'll be looking at. AridMonk: You are correct, that was my mistake. The leaves are going to get a good once over and then I might do a few bases of them just to show them off. Oh sweet, more leaves. Love those, they do add that certain something special to a base. Particularly to scifi stuff, they just seem to add extra contrast! Leaves on bases are really cool! Can't wait to see them show up in some of your upcoming work. I feel sorry for that little Chaos Marine. Poor guy's been laying face-down in a corner for nearly a month. Hephesto and Gary: Leaves are cool. I want to find a way to work them into my Novamarines bases. I'm not sure exactly how, but I'm sure I'll come up with something. Anon: He'll have his day soon enough. He destined to be an Alpha Legion marine with scaled armour. Until then, he waits for his time patiently. Elzo: It's kinda cleaned up now so I could do some sculpting. 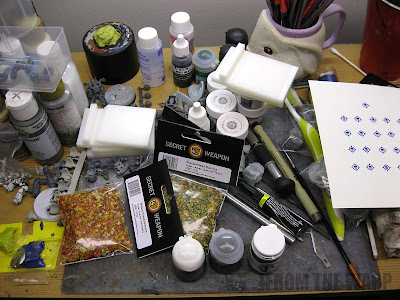 I need to go buy more greenstuff though.